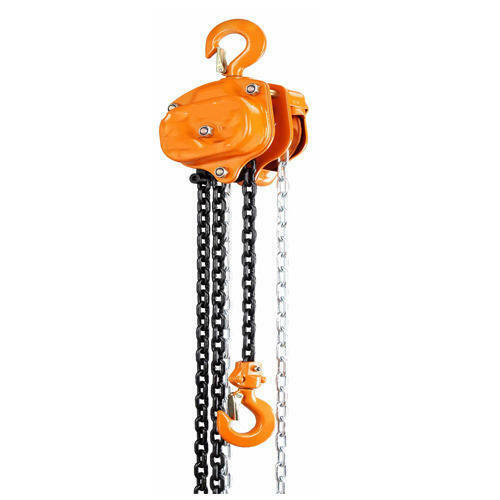 Backed by a diligent team of professionals, we have been able to manufacture, trade and supply a qualitative range of Chain Pulley Block. Our offered block is widely used for handling heavy equipments. We manufacture this block by utilizing advanced technology and quality assured raw material following the industry set standards. Furthermore, provided block is attentively tested against numerous quality parameters to ensure its excellent quality. Clients can avail this block from us at most competitive prices in the market. Established in the year 2009, we "Overseas Agencies" are leading organization affianced in manufacturing qualitative array of Pulling And Lifting Machine, Hydraulic Scissor Lift Table, Electric And Manual Stacker, Hydraulic Pipe Bender, Hydraulic Jacks, Hydraulic Hand Pump etc. Located at Pune (Maharashtra, India), we are supported by state-of-the-art infrastructural base that encompasses various departments such as Procuring, Production, Quality Testing, R&D, Sales & Marketing and Warehousing & Packaging. All departments work under the administration of capable professionals and enables streamline production. The production department is resourced with modern technology that assists our production team to manufacture products as per the international quality parameters. Owing to our fair business policy, timely delivery, affordable price range, reliable product range and client-oriented approach, we have been able to supply products to Indian Railways, Dockyards, Mines and Private Firms. Moreover, we also provide After Sales Service.